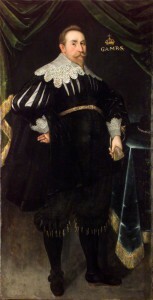 The Vasa was a grand ship commissioned in 1625 by Sweden’s King Gustav II Adolf to be the core of a new fleet of larger, more imposing warships that would dominate the Baltic theater during the Thirty Years’ War. By all accounts the four other royal ships fulfilled their commission ably until the 1660s, but Vasa, poor thing, never even made it a nautical mile from the dock on her maiden voyage on August 10, 1628. The ship was top heavy and unstable, but the King kept sending letters to the builders urging them to get Vasa on the water, so even though the builders and sailors knew there was going to be trouble, they set sail anyway. As soon as they encountered wind with more force than a light breeze, the ship heeled on the port side, taking in water through the gun ports. Once the water rushed in, it was all over. The ship sank 105 feet to the sea floor, only 390 feet from the shore, in full view of the assembled dignitaries from many countries, including ones that might have reason to delight in this dramatic failure of Swedish sea power. Despite being so close to land and in quick reach of a number of vessels, an estimated 30 to 50 men went down with the ship. There were several attempts to salvage the wreck right after it sank, but they failed. In 1664, a salvage operation retrieved over 50 of Vasa‘s valuable bronze cannons, tearing up the wood from the deck above the guns in the process. After that, the wreck was left pretty much alone to be scoured by the hard Stockholm bay currents, and abraded and dumped on by subsequent ships for 300 years. 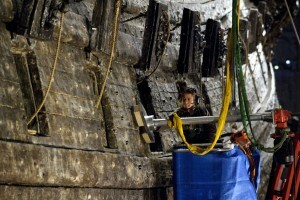 In 1956, amateur archaeologist Anders Franzén found Vasa again, and museums, the Swedish Navy, historical societies all put their heads together to figure out how to raise and preserve the wreck. 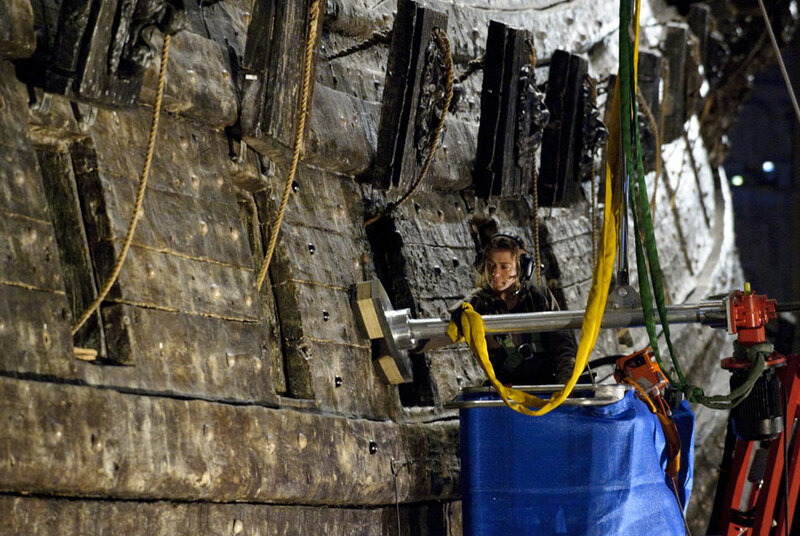 Ultimately, they used a system not all that different from what they tried to do in the 17th century: tunnels were dug underneath the ship and cables threaded through to pontoons on either side. Over the course of multiple lifts between 1959 and 1961, Vasa was gradually raised, until on April 24th, 1961, again before an audience of thousands present and countless more television viewers, the ship broke the surface. The ship was kept in a shipyard that served as a provisional museum for decades while archaeologists and conservators cleaned and preserved it. There Vasa was sprayed with polyethylene glycol (PEG), a polymer that replaces the water in wood ensuring it doesn’t warp, crack or shrink when it dries, for 17 years straight. 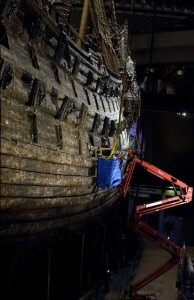 In 1990, the new Vasa Museum where the ship would be conserved on display opened to the public. Since this year marks the 50th anniversary of the Vasa‘s return to the surface, the museum plans a variety of events to celebrate. While they’re at it, the staff will give Vasa a thorough tuneup. It will be given an anti-corrosion treatment, and in a project that will take five years to complete, all the 5,000 iron bolts keeping its hull together will be replaced with stainless steel ones, made from a non-oxidizing alloy of chrome and nickel. “We need to remove the iron and the rust from inside the wood and replace (the bolts) by stainless steel that will not leak into the wood,” Vasa Museum head Marika Hedin said. This entry was posted on Friday, March 11th, 2011 at 8:06 PM	and is filed under Museums, Renaissance. You can follow any responses to this entry through the RSS 2.0 feed. You can skip to the end and leave a response. Pinging is currently not allowed. Did the Swedes have wheelbarrows? NO. NOBODY EVER HAD WHEELBARROWS. great blog congrats keep it up ! As much as people may have wanted to, I’m betting it was bad form to pull a Nelson Muntz on the King. I’m sure they did it discretely behind gloves hands. So 300 years ago, the Swedes completely and utterly failed at building a warship. 300 years later, the Swedes completely and utterly succeeded in raised said completely and utterly failed warship from the sea.